What is Cosmetic Dentistry in Adelaide? Different types of people need different types of dentistry. Some people need just simple fillings, others require crowns and bridges. Other people benefit from Adelaide Teeth Whitening, Lumineers, Invisalign or Orthodontics. No matter what type of cosmetic dentistry you need, we have Payment Plans available for you. Here are some photos to give ideas of some different types of treatments. (We have changed the names of the patients below for privacy reasons). 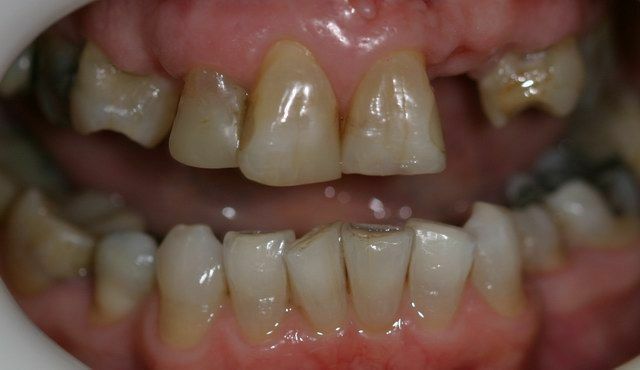 Susan had old and stained veneers with unsightly fillings around the veneers. 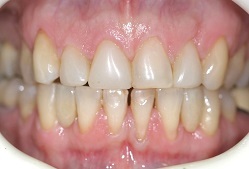 We removed the old veneers using our laser which preserves the tooth structure underneath. The temporary veneers in the middle photo look terrific and are what Susan walked out with at the end of that first visit. The final photo shows the finished 6 veneers which are tremendous and a huge improvement on Susan's original appearance. This type of work is why we go to work each day. You can imagine how happy she was with the result! Rita has gaps in her lower teeth. 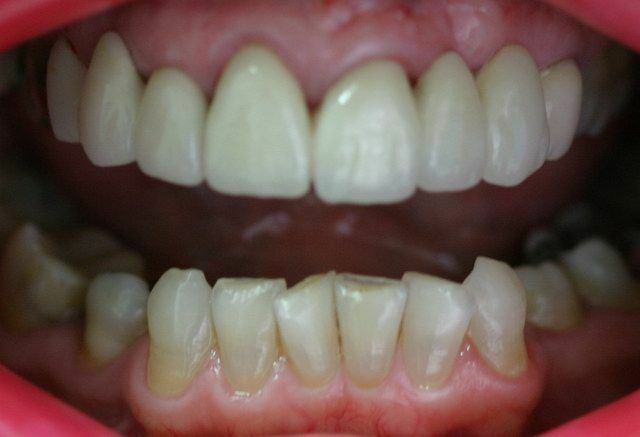 We have placed bonded bridges on the lower teeth to fill in the missing teeth which detracted from her smile. A very simple procedure which involved some taking moulds or impressions of the lower teeth and then having the new porcelain teeth created. It was all finished in a week and a half. Ray wanted to improve his appearance. His front teeth were worn, brown and there were ugly gaps at the front. We placed bridges on the front teeth to rebuild his smile and close those gaps. This covered the brown teeth and changed the shape to a more pleasing shape. It is completely different in the before and after photos! He was much happier with his new smile and so was Ray's wife. Sometimes there are many things wrong in a smile. It can be missing teeth, it can be the shape of the teeth or the colour. In the first photo below Jane has a denture replacing several missing teeth. The blue arrows highlight the denture teeth. We lightened her teeth prior to the photo and you can see the lower teeth are now lighter than the upper teeth. Sometimes there are many things wrong in a smile. It can be missing teeth, it can be the shape of the teeth or the colour. In the first photo below Jane has a denture replacing several missing teeth. 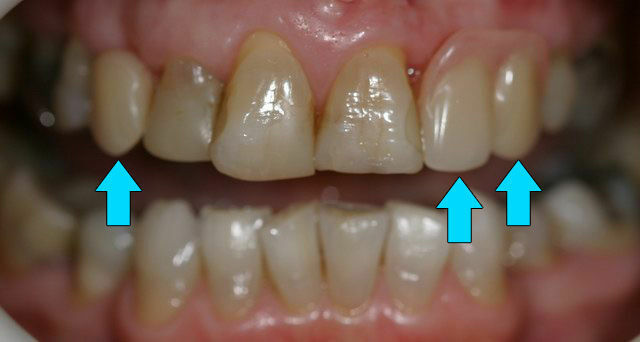 The blue arrows highlight the denture teeth. We lightened her teeth prior to the photo and you can see the lower teeth are now lighter than the upper teeth. In the photo on the right we have removed the denture and you can see the difference that these gaps make to her smile. 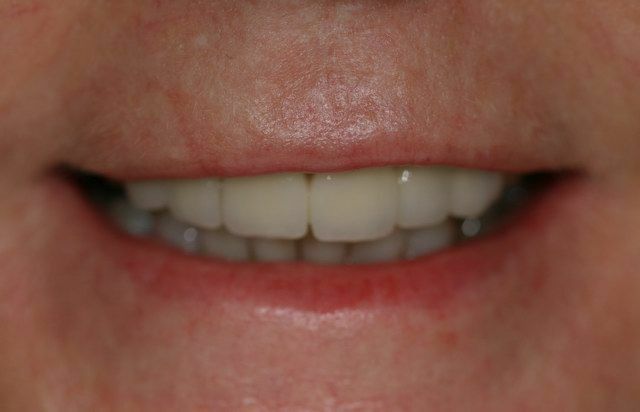 In the photo on the left we have removed the denture and you can see the difference that these gaps make to her smile. 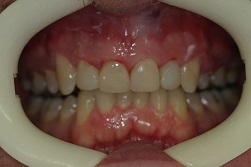 In the makeover we try and bring the colour of the upper teeth closer to these lower teeth. 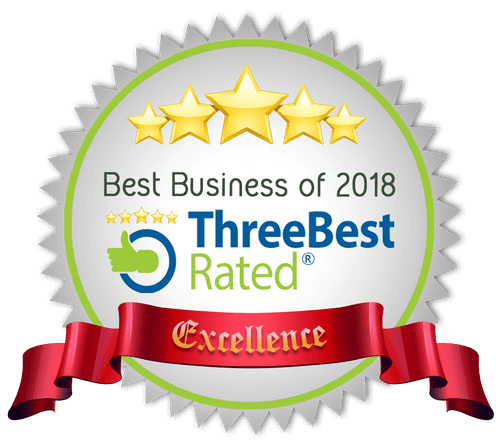 A great final result! This lady wanted to get rid of her dentures and fix her smile. She thought her teeth were too uneven and needed a big change. It is important to assess crucial points of a smile before starting such as the lip line, where the alignment of the teeth are and what options are available to improve your smile there we aim to get rid of a denture that was ill fitting and provide a beautiful smile. Here is the finished result, a dramatic difference to the variety of colours and shapes above. The teeth are in harmony with the lip line, the colour is pleasing to the eye and the shapes of the teeth are nicely curved and reflect well on the patients overall appearance. A New Smile with Fillings. Not everyone has an award winning smile but everyone wants to improve how they look. Mark had let himself go through too many sugary drinks and not brushing his teeth. As they started to look bad, he stopped brushing altogether. Mark wanted to fix his front teeth and get back to looking and feeling good. We removed the decay and then rebuilt the teeth using composite resin (white filling material). The end result is dramatic and has given Mark his self confidence back. Sarah had worn her teeth down over a long period of time. We rebuilt her front teeth using fillings to gain the increase in length of her teeth that you see in the after photo on the right. Michael had quite severe marks on his front teeth. He wanted them improved but had a limited budget. We put many fillings on his front teeth to make them look younger and whiter. Toby wanted his rough teeth look improved quickly. We placed several fillings on his front teeth and reshaped them. The difference is dramatic. Can new dentures fix my teeth? Sometimes the problem is not the teeth but an ill fitting denture. Helen was disappointed with the gaps in her front teeth. We made a new denture for her and the gap was closed. A simple procedure that improved her smile.